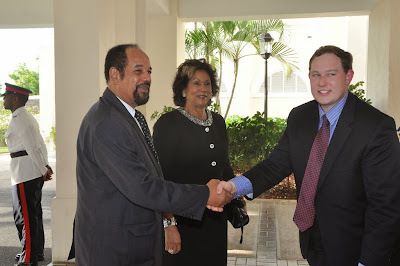 GETTING A GRIP: Harding (left), with wife Marigold and a US official at the American Embassy in Kingston. Below, a pair of ceramics designed by Jag Mehta. To hear him tell it, Ossie Harding could have pursued a serious career in the visual and creative arts. "As a student, I was very much interested in form much more than colour," he confesses, "and teachers always thought I was going to be a great artist, but that didn't happen." Clearly not. As we all know by now, Harding went on to become one of the most distinguished politicos and senators in recent Jamaican history, not to mention a luminary of the legal profession. Still, his deep-seated love of art, ceramics in particular, isn't something he could give up entirely. "One day I saw the Cecil Baugh collection, and I just became inspired to start collecting. Fast-forward to 2013, and you'd be hard-pressed to find a more vast and impressively divers collection comprising exquisite ceramic pieces. "Ever single major teapot in Jamaica is in my collection," he says. "I also have English, American, you name it. I have at least 50 different teapots, which is just a sub-collection of my ceramics." To his credit, Harding has also emerged somewhat as an authority on the work of notable artists such as the esteemed Jag Mehta, who just debuted a fantastic new collection at the Bolivar Gallery in Kingston. "It's not fussy; it's not superdecorated. It's just dealing with for," Harding says of Mehta's work. "And there's a purity to it that speaks of simplicity." Armed with his vast knowledge and matchless appreciation, Harding is content to continue serving as a committed patron rather than switching lanes into the creative realm. "Based on my instincts," he admits, "I prefer to be a supporter of the arts."